A general view of the Mike O'Callaghan-Pat Tillman Memorial Bridge part of the Hoover Dam Bypass Project is seen left of the Hoover Dam October 26, 2010 in the Lake Mead National Recreation Area, Arizona. 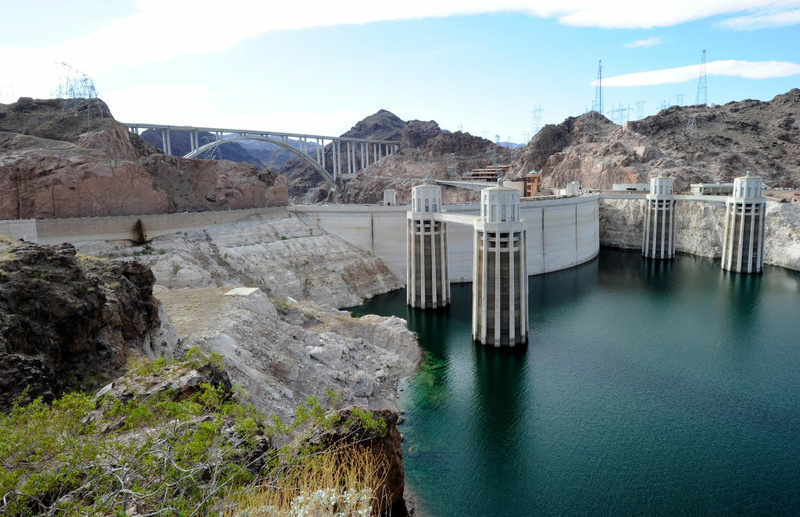 The 1,900-foot-long structure sits 890 feet above the Colorado River, about a quarter of a mile downstream from the Hoover Dam. The USD 240 million four-lane bypass project to relieve vehicle traffic on the Hoover Dam began in 2003, and opened to traffic on October 19. We've heard a lot about immigration today but one of the other big issues President Obama pledged to tackle in his inaugural address is climate change. It's an important issue for California, which relies on heavy snow in the winter and abundant runoff in the spring to produce cheap energy. But the effect of climate change on hydropower is not an issue that many federal regulators have chosen to address. KQED's Molly Samuel has more.